2018Part of the History of Great Power series compiled by professor Qian Chengdan of Peking University, A History of Germany was written after 10 years' key leadership in their fields by renowned German history experts Xing Laishun and Wu Youfa. Part of the History of Great Power series compiled by professor Qian Chengdan of Peking University, A History of Germany was written after 10 years' key leadership in their fields by renowned German history experts Xing Laishun and Wu Youfa. It has won solid support from other German history scholars. It is the first largescale compilation in China using more than three million words to describe the general history of Germany. Symbolizing and summarizing China's studies of German history, the series is set against the background of European civilization and world history, and rolls out Germany's past from prehistory to the year 2010. ·Wu Youfa is a professor at Wuhan University; he is also head of the Chinese association of historians of German history. 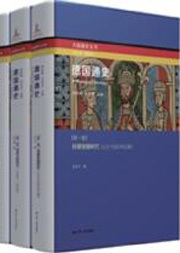 With his studies focusing on the history of Germany and the World War II, Wu has compiled 13 related academic works. ·Xing Laishun is a professor at Central China Normal University. He has compiled and translated over 10 works on German history and culture, and has published nearly 60 papers in various journals.